The UTHealth School of Public Health in Brownsville offers certificate programs, a general Master of Public Health degree, a Masters of Public Health degree in Epidemiology and a Masters of Public Health degree in Health Promotion & Behavioral Sciences. The campus also offers two doctoral degrees: a Doctor of Philosophy in Epidemiology (PhD) and a Doctor of Public Health in Health Promotion (DrPH). Students applying to the Brownsville campus may also qualify for competitive scholarships offered by UTHealth School of Public Health (school-wide) or Brownsville-campus-specific scholarships. 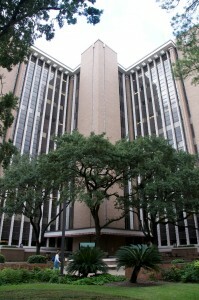 The Hispanic Health Research Center (HHRC) is housed at UTHealth School of Public Health in Brownsville. The center’s main focus is to reduce or eliminate health disparities that exist in Hispanics living in the South Texas Border Region and nationally. The diverse faculty interest provides a multidisciplinary, global approach to the center’s mission. Faculty represent the EHGES and Health Promotion & Behavioral Sciences divisions which enables an integrated translational approach to public health in underserved areas through scientific discovery and community-based programs to improve health and prevent disease. Students of the Brownsville Regional Campus may enter into one of 8 degree seeking programs or into the Certificate of Public Health. A five course, 16 credit survey of public health practice and theory. Designed to be completed in one year, this program is available online, in-class or as a hybrid. A 45 credit hour professional level degree that prepares students for a variety of career tracks in the broader fields of health services, health and population based research, community based practice, disease and numerous other public health careers. A 45 credit hour professional level degree that is designed for students specifically seeking careers in epidemiology and disease control, or as preparation for advanced doctoral level studies in population based health and disease. A 45 credit hour professional level degree that is designed to prepare students for careers of advanced studies in community based health services, health promotion and health related behavioral sciences. A terminal professional degree that is focused on the practice and application of population based health promotion, health services, accessibility and the greater practices of community based health. The DrPH program requires a minimum of 48 credit hours and combines classroom on field based learning. For more information about the Master of Science in Health Informatics please visit our SBMI Website. This is a 3 or 4-year program that prepares students to integrate public health informatics knowledge and skills in their professional lives as practitioners and researchers. MPH application deadline is December 1st to start in Fall and SBMI applications deadlines are March 1st to start in the Summer, July 1st to start in the Fall and November 1st for Spring admission. This program can be completed online or in person. For more information on the Dual Degree in Public Health Informatics please visit our SBMI DUAL DEGREE site. Complete the online application for certificate or non degree admission available through SOPHAS Express. If selected, applicant will be called in for an interview. Submission of official GRE general exam scores. Two letters of reference highlighting your interest, potential or ability in public health. Submit an original personal essay identifying your interest in our program and university, all submissions are Safe Assign verified. Most applicants educated outside of the United States are also required to submit an official transcript evaluation from either ECE or WES and satisfactory scores of the TOEFL exam with their application; this also applies to certificate and non degree candidates. A complete list of all services and requirements are available through the Office of Student Affairs webpage under, Newly Admitted Students. Every applicant to the a degree program at UTHealth School of Public Health is eligible for nomination for the New Student Scholarship. Recipients of the scholarship will have up to $1,000 per semester available to cover costs associated with tuition and fees for their first calendar year of study at the School of Public Health (total of 3 semesters). All students applying to the Brownsville Campus will also be considered of . Returning students have the opportunity to apply to the Serafy Foundation Scholarship, an award dedicated only to continuing Brownsville Campus students and is based on academic merit. Research is an integral part of the comprehensive learning experience in any graduate program. At the Brownsville Campus, students are encouraged to apply to competitive Graduate Research and Graduate Teaching assistant positions. These positions are primarily available to returning students and are contingent on available funding and student qualifications. Each MPH and DrPH student must complete a practicum experience prior to graduation. A practicum is a planned, supervised and evaluated “real-world” experience that allows you to use the knowledge and skills acquired in the classroom and apply them in a community-based setting. The practicum should be directly relevant to the student’s educational and career goals. Completing the online orientation and quiz. Ensuring that a copy of the completed Learning Contract is placed in their file prior to the practicum’s start. And consulting with your advisor or contacting the Office of Public Health Practice for assistance as needed. We would like this to be a combined effort, so if you find a great practicum/volunteer opportunity, please ask your preceptor/supervisor to fill out the Practicum Description Form. You may submit the form via email to the campus in Brownsville or fax it to 956-755-0606 so that we may investigate the possibility of offering a similar opportunity with the same organization, to future students. UT-SPH Brownsville regional campus also offers opportunities of collaborations with regional colleges such as UTRGV and Regional Academic Health Center (RAHC) at Edinburg. Both institutions have senior, qualified and highly enthusiastic faculty that are ready to collaborate on wide variety of projects such as infectious disease, health disparities, border health to name a few. Additionally the universities and institutes off a wide range of sophisticated core facilities to further research in the valley. The faculty at the Brownsville Regional Campus integrate their expertise and research experience to improve Hispanic health in the Lower Rio Grande Valley. UTSPH at Brownsville houses the Hispanic Health Research Center and is located on the University of Texas Brownsville campus, adjacent to the UTRGV Life and Health Sciences Building. Facilities include the Clinical Research Unit, on-site laboratory facilities (BSL-2, BSL-3), Tu Salud Si Cuenta and the Blanca Ortiz Community Outreach Annex. Faculty at the Brownsville Regional Campus draw on their extensive experiences to provide interactive teaching and research mentoring to our students. Students are encouraged to engage in the research process and to work with one or more faculty throughout their degree program. Many opportunities are available for our students to participate actively in funded research. Belinda Reininger: Designs and examines the effectiveness of interventions based on behavioral theory and the Ecological Model to improve health outcomes associated with obesity and related chronic diseases among Mexican Americans. Blanca Restrepo: Studies the biological basis (immune dysfunction) for the higher susceptibility of diabetes patients to tuberculosis and explores the epidemiology of the association between both diseases in the Texas-Mexico border. Susan Fisher-Hoch: Clinical, metabolic, immunological, proteomic and genetic studies, including gene expression, focused on understanding and preventing the complications of diabetes obesity and their complications. Translation of these studies to Global Health sites. Joseph McCormick: Impact of obesity and diabetes on the mental, social and physical health, on the immune system and response to infectious diseases, as well as, intervention studies that could improve the health of the community. Long-term research includes viral hemorrhagic fevers and HIV. Please contact our student coordinator for more information. Scholarships now available for Brownsville Students. Find out more about life in Brownsville for UTSPH students.